In the heart of Venice! A few minutes from the most famous places in the city: Piazza San Marco, Rialto, Arsenal ... .. A romantic atmosphere with views over the rooftops of Venice crown your stay when you're not around streets, churches or museums. 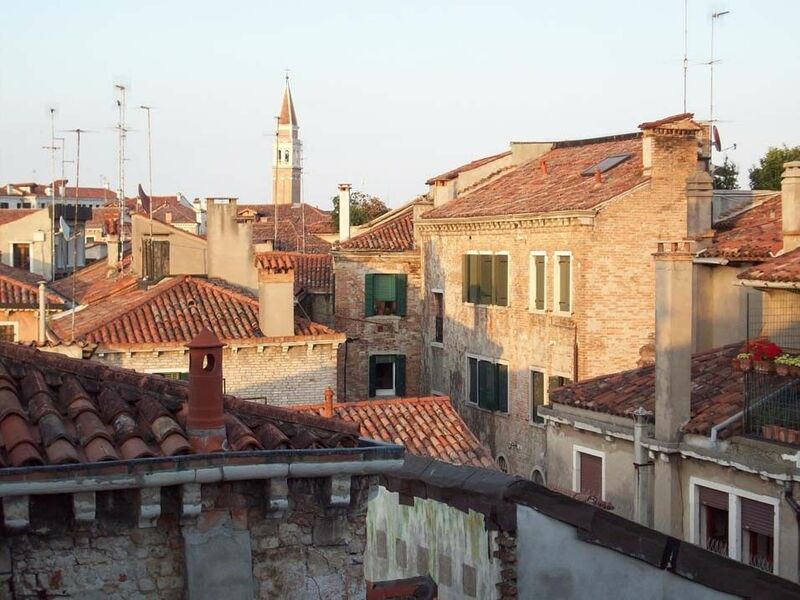 The loft is part of a historical building of the '300 overlooking a typical Venetian square with bars and shops frequented by Venetians themselves. The nearby San Zaccaria and RIalto vaporetto stops easily connect you to the Lido (beach), the train station, Piazzale Roma and Tronchetto, and Marco Polo airport in Venice. Ideal for two people but can accommodate two more guests thanks to the sofa-bed in the living area. Nearby: taverns, restaurants, newsstands, ATMs, florist, pharmacy and a well stocked supermarket and not at all expensive! Everything is done so that you can immerse yourself with ease in a typical day in Venice. Walking in the company of a resident: If one or more days of your stay you'd like to be accompanied by a 'resident' through Venice's most famous places or rather discover the unknown Venice, or even visit some of the islands of the lagoon, or the Palladian villas of the Venetian hinterland or in the end simply walk across the town pausing to drink a coffee or a typical Venetian aperitif, simply require on time and according to the availability of your 'Cicero' you can enjoy the incomparable advantage to see and experience Venice in terms of a 'Venetian '. The service is offered directly from 'Casa Ruskin'. If you are interested ask for more information. In the appartment there are two fan coil and a mobile air-conditioner for the living room. The bedroom can accommodate up to two people and two others can use the sofa bed in the living room. The television is connected to 'sky' and then there is the chance to see live sporting events and movies in their original language. Amazing location, great to be able to prepare food and Luca was lovely. Luca's place was perfect for us. It's so close to St Mark's and Rialto bridge; two of the major tourist highlights of Venice. His communication was prompt and clear and he was lovely when we met him; giving us some recommendations for restaurants etc. The only small drawback was the lack of air conditioning as it was very hot when we were in Venice, but we knew about this when we booked and it seemed like it was still a real bargain for the price, given the location and comfort in other ways (which it certainly was). It was brilliant to be able to make food at home, including trying out a pasta with ingredients from Rialto market. My wife and I would thoroughly recommend a stay at Luca's place and very much hope to go back ourselves sometime. We really enjoyed our stay at Ruskin House. Everything was very clean and for the most part well laid out. Even the 86 or so steps up to the apartment were not a problem, even for my 80 year old mom. Two benches on different landings gave opportunity for mom to catch her breath and the stairs were wide and had good railings. The views were wonderful, and the nightly concert of the ancient cathedral bells absolutely amazing. Luca was a very helpful host all around, even arranged for another hotel for us when I wanted to extend our stay by one night short notice and he did not have any more availability. Thank you! No review would be complete without mentioning a few things that did not work so well for us so here it goes: there were no mosquito screens on the windows except for one small one. Mosquito netting was also not available to put over the bed at night as another way to keep those relentless bloodsuckers at bay. Needles to say, we suffered and sleep was scarce. Luca does have a portable AC, which I pulled out of the closet and put next to the kid's bed, so at least we could keep the windows closed in the living room area despite the heat. All in all we would definitely come back but equipped with ample mosquito netting!! Our visit in Venice has been just great. Owner of the flat is very helpful and kind person. He kindly answers on all questions about prices, visiting and restaurants. He knows his city very well. Our flat has been clean and really well furnitured (especially kitchen). We found some guide books written in English which were very helpful. Flat is situated in quiet and nice place just between Rialto and San Marco. Is is not a problem to get any places to visit, localisation is perfect. There is a big shop just nearby, so it do not take hours to buy some food etc. We can strongly recommend this flat. We wish you a pleasant stay in future as ours! It is Always a pleasure to recive guests who wants to know about the town !!! And i love to reveal them all the best places for the venitians and for them too..
Nous revenons d'une semaine complète passée à Venise, bien sûr nous sommes tombés sous le charme de la ville. Casa Ruskin a contribué grandement à la magie de notre séjour. L'appartement est idéalement situé, tout près des monuments les plus importants, du vaporetto, et au milieu de petites" calle" tranquilles. Il est agréable de rentrer le soir ou de faire une petite pause dans la journée au calme absolu. L'appartement est très confortable, clair, l'aménagement complet et la décoration très sympa. Notre propriétaire nous a accueillis chaleureusement, a été disponible tout au long du séjour. Nous ne manquerons pas de recommander ce lieu à amis et connaissances. Un conseil : levez-vous tôt le matin pour admirer le lever de soleil sur les toits et le campanile... une splendeur!!! Thanks a lot for your wonderfull words. I hope to recive you again.